The Plantronics headsets are all-day comfort and superior sound quality of our headsets empowers contact center workers to provide exceptional service. The all-day comfort, reliability, and durability our EncorePro Family is known for, with the addition of built-in call control. The Plantronics EncorePro 700 USB Series is ready for every call because every call matter. Models are EncorePro HW715 USB and EncorePro HW725 USB. The highest performance headsets for highest performing employees deliver award-winning design, luxurious comfort, and a premium look and feel. Reward your top performers with our top-of-the-line Plantronics EncorePro 700 headset series, designed for customer service representatives. Its distinctive design is slim and stylish with an elegant satin finish. Plantronics reseller its featherweight materials and leatherette ear pads ensure luxurious comfort, while its unique curved, telescoping microphone and pivoting boom deliver crystal-clear, private conversations. The EncorePro 700 Series – the thoroughbred of headsets. Models are Plantronics HW710 and HW720. The Plantronics EncorePro 500 Digital Series with DA90 USB audio processor and Plantronics Manager Pro, an additional service, is a fully integrated audio and asset management solution for customer service centers. Centralized management with Plantronics supplier Manager Pro enables IT to track detailed insights about devices. And all-day comfort with superior audio quality— including a noise-cancelling microphone with wideband audio—gives customer service representatives the tools they need to provide outstanding customer interactions. Models are Plantronics HW510, HW520, HW530 and HW540. EncorePro 500 CORDED USB HEADSET models are HW515, HW525, HW535 and HW545. The all-new Plantronics EncorePro 540 is a quantum leap in convertible headset design. It’s a 3-in-1 headset without compromise – all of the wearing styles are designed with quality and comfort in mind,in a system that is simple to convert but delivers a secure, positive fit and finish. The plantronics partner HW540 shares the advances of the other members of the new family, with high-quality audio, a flexible mic with visual positioning guides, soft ear cushions, and durable-yet-lightweight materials for all-day wearing. The Plantronics EncorePro 520 is the binaural version of the all-new EncorePro 510 design, covering both ears to provide greater focus and concentration by blocking background noise. The EncorePro 520 also has soft ear cushions for all-day wearing comfort, metal joints that deliver durability and reliability, and a flexible mic with visual and tactile positioning guides for precise positioning and clearer conversations. It’s not just what you say, it’s how you’re heard. The Plantronics SupraPlus is the solution of choice for contact center agents the world over. Models are HW251 and HW261. Over-the-ear, over-the-head, or behind-the-head? You decide with this convertible model. Whichever way, Plantronics DuoSet office headset delivers clear conversations and all-day comfort. When you deploy softphones in your customer service center, Plantronics DA Series USB audio processors deliver a more complete audio experience by providing context for every call. The DA Series offers exceptional audio quality and control while helping you gain deeper insights and meet OSHA and Noise at Work specifications. When combined with Plantronics Manager Pro, an additional service, you will be able to communicate with intelligence and create new experiences for your team and customers. Models are DA90 and DA80. Simplify your transition to Unified Communications (UC) by helping manage calls from desk phones, softphones, and even mobile phones with the same headset. The Plantronics MDA220 USB means voices are heard and calls are answered quickly. One-touch remote call control puts teams in charge of their desk phones and softphones. Wideband and stereo audio support makes calls sound naturally clear. Simple to use, easy to manage. The Plantronics MDA100 QD Series makes your transition to softphones and unified communications seamless. These intuitive switches help manage audio from different sources, without changing headsets. Models are MDA100 QD and MDA105 QD. A unique mix of advanced audio technologies makes the Plantronics VistaPlus AP15 Audio Processor the ideal choice for contact centers and phone-intensive environments that require the highest level of audio accuracy and clarity. The Plantronics MX10 Universal Audio Processor connects your telephone and PC or external audio device to a Plantronics headset and provides control of the sound through your headset. Whether your office is quiet and traditional or a beehive of activity, our solutions help you be at your best. The Plantronics Blackwire 5200 Series fits your busy workday. Easy to use, USB/USB-C and 3.5 mm connectivity options let you work on a variety of devices. And it’s so comfortable, you’ll be able to wear it all day. Models are Blackwire C5210 USB, Blackwire C5220 stereo USB-A and Blackwire 5200 stereo USB-C. The Plantronics Blackwire 3200 Series includes corded UC headsets that are durable, comfortable, easy to deploy and come in a variety of connectivity and wearing options. Add insights from Plantronics Manager Pro, an additional Software-as-a-Service offering, and you’ve got a future-proof solution. Blackwire 3200 Series with Plantronics signature audio provides top notch features at a price you can afford. Models are Blackwire 3210, blackwire 3215, Blackwire 3220 and Blackwire 3225. The Blackwire 725 USB headset offers Active Noise Canceling technology, hi-fi stereo performance and all-day comfort so you can tune into work and tune out noise. The Blackwire 725 USB headset is great for keeping you focused in noisy office environments. Featuring Active Noise Canceling technology, a noise-canceling mic, and hi-fi stereo performance, the Plantronics Blackwire 725 minimizes external noises while ensuring that PC-based calls and multimedia come through crystal clear. With the Blackwire 725, distractions go down and productivity goes up. Models is P/N: 202580-01. Meet the first corded headset designed for Unified Communications that’s as discreet as it is professionally sound. The headset’s modular over-the-ear design can be worn with two ear buds for stereo or converted to one ear bud for mono use depending on the user’s preference. The ultra-discreet design and superior audio quality you’ve come to expect from Plantronics make this headset ideal for video conferencing, PC telephony and multi-media applications. Even more, it comes with a rugged protective carrying case, so you can easily take it with you. With the Blackwire 435, you don’t have to compromise between style and sound quality. When you need exceptional conferencing performance in a small group conference room, turn to Plantronics Calisto 7200. Four directional microphones that provide 360˚ coverage and filter out unwanted noise. With USB and Bluetooth connectivity and touch-sensitive controls, Calisto 7200 is ready when you are. Designed for 4- to 6-person conference rooms, Calisto 7200 makes sure everyone on the call is heard with crystal clarity. 360˚room coverage with echo cancellation ensures disruption-free collaboration. Next-generation portable USB handset makes the evolution to PC communications simple. Make the evolution to PC communications simple with the new Plantronics Calisto 240 USB handset. An LCD display and integrated speakerphone means making calls from your PC is easier than ever. The Plantronics S12 Telephone Headset System offers hands-free convenience and comfort. Includes a 2-in-1 convertible headset for over-the-head stability or over-the-ear convenience, a noise-canceling microphone for superior sound clarity and the Firefly in-use indicator light that lets others know you are on the phone. Plug-and-play simplicity with crystal clear audio – all at a very reasonable price. Let your team focus on collaboration rather than connecting peripherals. With a versatile 3.5 mm cable, Plantronics Blackwire 215/225 can work with laptops, smartphones and tablets. Plus, the controls are so intuitive that anyone can use them. Enter UC with the best-featured headset you never thought your budget could buy. The Plantronics Blackwire 310/320 USB headsets deliver simplicity, durability, comfort, and professional sound at an entry-level cost. Meet the Blackwire 310/320 corded USB headsets designed for companies just starting out with Unified Communications. The headsets easily and intuitively juggle PC calls and multi-media using audio alerts to manage connection, mute and volume status. Easy to use, the Blackwire 310/320 offers premium hi-fi stereo audio (C320) and all-day comfort. Meet the Blackwire 500 Series corded USB headsets with our industry-first Smart Sensor technology. It easily and intuitively juggles PC calls and multi-media using audio alerts to manage connection, mute and volume status. With easy portability, it offers premium hi-fi stereo audio (Blackwire 520) and all-day comfort at your desk or at home. Models are Plantronics Blackwire 510 and Blackwire 520. Plantronics Blackwire 710/720 is the versatile UC headset that offers high-quality PC audio and seamless Bluetooth connectivity to mobile phones and tablets. Enjoy unmatched audio quality, smart sensor technology that automatically answers a call when you put on the headset, and a detachable cable for taking your mobile calls throughout the office. Small and lightweight, the Plantronics Calisto 600 series speakerphones provide professional-sounding audio wherever you touch down. Looking for anywhere conferencing? The Calisto 600 Series offers two options. The Plantronics Calisto 620 is a portable wireless UC speakerphone that instantly transforms your laptop or smartphone into a premium-quality conferencing device. The Plantronics Calisto 610 is a corded USB speakerphone for plug-and-play conferencing convenience. Plantronics legendary CS family is setting a new wireless standard for desk phone communication with the CS500 Series. The system features the lightest DECT headset on the market, a streamlined design and improved performance all with the same reliability for hands-free productivity that has made the CS family a best-seller for nearly a decade. A sleek charging base is included with the CS500 Series. An adaptive power system optimizes for range and talk time by automatically downshifting to low power when the headset is close to the base to save battery life. The Plantronics CS500 XD Wireless Headset Series was designed to address wireless density issues, so that more wireless headsets can be used in the same space while maintaining clear conversations. Using 900 MHz technology, the CS500 XD Series provides up to 350 feet of range and includes a convertible headset with a hot swappable battery (CS545-XD) for unlimited talk time. The highest level of wearing style choice and best-in-class PC audio in a convenient, portable package. For PC-based office and remote workers, the Savi 400 Series offers excellent audio quality, up to 300 feet of wireless range and your choice of four wearing styles including the Savi 440 – the lightest DECT headset on the market that features a hot swappable battery for unlimited talk time and can be worn three ways to match your personal style. Models are Savi 445, Savi 440, Savi 430, Savi 420 and Savi 410. The Savi 700 series is changing the way productivity-focused office professionals communicate. 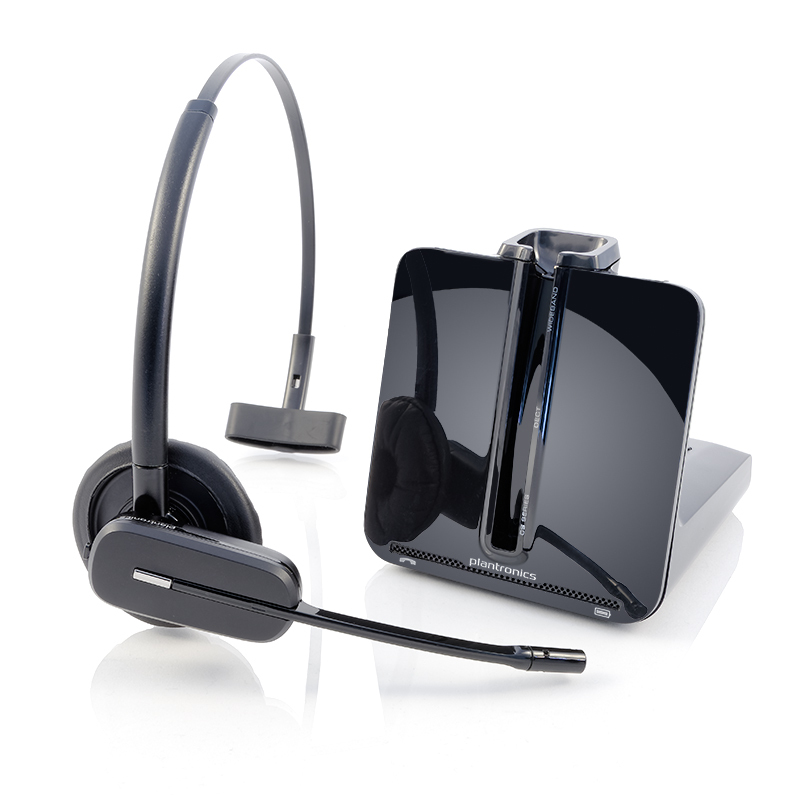 With multi-device connectivity, a newly designed convertible headset, and up to 120 metres of wireless range, now you can easily manage desk phone, PC and mobile phone calls with the most intelligent wireless headset system on the market. Models are Plantronics Savi 745, Savi 740, Savi 730, Savi 720 and Savi 710. With premium features and professional-grade audio, Plantronics Voyager 6200 UC is a Bluetooth neckband headset with earbuds that has the versatility to go beyond the office. Transitioning to your next conversation is easy: Connect with colleagues working remotely, listen to music to focus distraction-free or drop an earbud to tune in to the conversation around you. You can count on Voyager 6200 UC for outstanding audio every time, everywhere. Be ready to take the call, wherever you’re connected. The Plantronics Voyager 5200 UC Bluetooth headset offers our most advanced, adaptive noise cancelling with Wind Smart technology to reduce disruptive noise. It’s ready to work. Plantronics Voyager Legend UC meets the demands of mobile professionals like never. With connectivity to PC, smartphone, or tablet, sensors, precisely-tuned audio, voice controls and advanced charging accessories – it’s the only headset system you need for your mobile life. Cradling the telephone handset between your shoulder and ear can result in shoulder discomfort. A Plantronics headset eliminates the need to hold the telephone in this uncomfortable position. Your shoulders can stay completely relaxed as you enjoy a new level of comfort and freedom. Squeezing the telephone between your shoulder and ear can be very stressful on your neck, often causing muscle spasms and stiffness. With a Plantronics headset you can keep your neck in an upright position. You’ll appreciate the difference immediately. Craning your neck during extended phone calls can lead to improper cervical alignment. The result can be reduced blood flow and accelerated muscle fatigue. Plantronics headsets help to eliminate this problem by freeing you to move and sit more naturally. By making your workstation more comfortable and by freeing up your hands for other tasks, you’ll find that you can get more work done each day. Headsets are known to reduce the chances of work-related physical disorders, specifically injuries of the neck and upper body, resulting in reduced workers’ compensation costs. Buy Plantronics headsets in Bahrain, Oman, Saudi Arabia, Africa, Kenya, Nigeria, South Africa, Uganda, Costa Rica, Croatia, Czech Republic, Cuba, Cyprus, Iraq, Malaysia, Maldives, Algeria, Morocco, Egypt, Jordan, Kuwait, Lebanon, Tunisia, Angola, Ethiopia, Portugal, Russia, Ukraine, Ghana, Korea, Japan, Thailand, Zimbabwe, Abu Dhabi, Sharjah, Ajman, Al Ain, Ras Al Khaimah, Fujairah, Doha, Manama, Muscat, Riyadh, Dammam, Baghdad, Sana’a, Cairo, Beirut, Kabul, Khartoum, Nairobi, Afghanistan, Brunei, Cambodia, Georgia, Kazakhstan, Kyrgyzstan, Laos, Mongolia, Palestine, Syria, Yemen, Vietnam and Uzbekistan, Senegal, Congo, Tanzania, Cameroon, Mali, Cote doloire, Madagascar, Sudan, Mauritius, Rwanda, Libya. Our other headsets are Jabra headphones and sennheiser headphones.